Here's a paintings by Degas from the National Gallery in London that, when I see it in real life, is very hard to leave. That's always the sign of a good painting. It's a big painting, and it's a red painting. Big and red. Those are the things you notice. It's really audaciously red, with just touches of black, grey and yellow. What does the colour red say? Red is passion - love - danger - fire - blood - rubies - lots of intense things. And it's a Whole Painting in Red! Once owned by Matisse (there was an artist who liked to paint pictures about a single colour) it depicts one of Degas' favourite subjects in his later years, and is based on several drawings and an earlier pastel. Just take a look at the composition of the painting. What sort of a space are the two women in? The space is ambiguous; you can't tell what sort of a room it is, the only hint being a curtain of some sorts at the top left. The woman having her hair combed must be sitting in a chair, but you can't really see the chair (although in the preliminary pastel, the chair was quite distinct, as are her facial features). The table is tipped up. The yellow brush (is it a brush?) hangs precariously over the edge. When you look closely, everything is simplified. Just take a look at the most important item, the comb, it doesn't even have any teeth. The hair isn't even hair, it's just a red mass. It's a monotype (a one-off print) , so it's a means to an end rather than a finishing point, but it's a way of playing with ideas and possibilities. But you can still easily read in La Coiffure what's going on, despite its simplification of forms. The central great figure-of-eight rhythm of the composition, reading from the arm of the woman having her hair brushed, down her hair, round the circle made by the arms of the woman on the right, back down the hair and round the other circle of arms, suggests the steady rhythm of the brushing of the hair. So why should something so mundane be the subject of a painting? What's going on? The implication would seem to be that its a mistress having her hair brushed by her servant. Therefore the left-hand woman is dominant to the other. However, the maid seems to be the dominant one, the one in charge, almost like a mother. Maybe she is a mother. Maybe the woman having her hair brushed is about to become a mother - she seems to be pregnant. But it's difficult to decide whether the brushing is producing pleasure or pain (she does seem to be wincing somewhat in the earlier pastel). Maybe it's both. It's not a painting about history, or war, or Greek myth. It's about women's lives, an intimate moment, an everyday thing of no significance. Painted by a man. A man watching it, in the room as well. 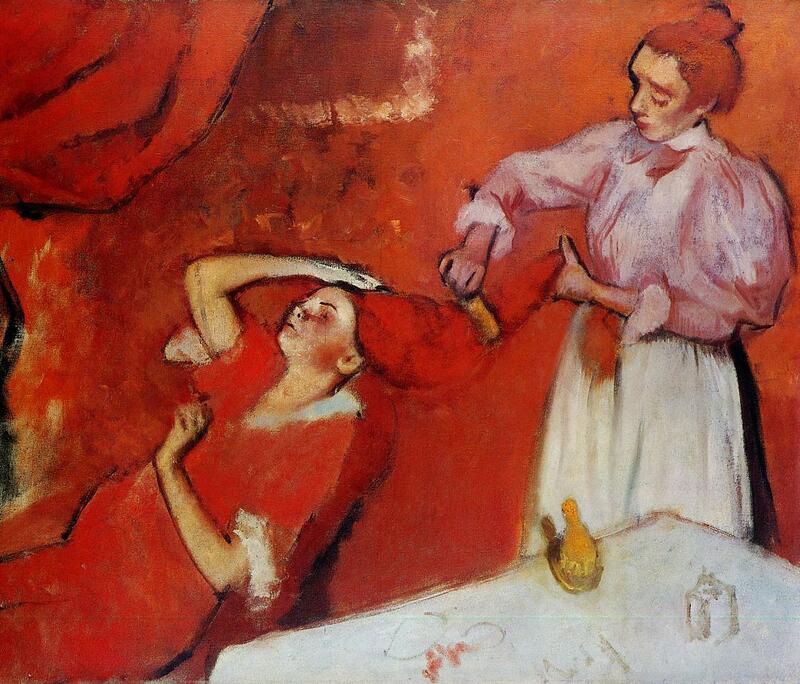 Degas loved painting women. He paid them to take baths in his studio, and drew them getting in and out of the bath, sponging themselves, drying their bodies. Which is all rather voyeuristic, but they don't seem to have minded. They always seem perfectly at ease. He loved the ballet, and endlessly painting and drawing ballet dancers, the way their bodies twisted and moved and worked, like the bodies of nervous horses. In fact, his bronzes or horses are very like his bronzes of ballet dancers. Women aren't idealised by Degas. They are observed. The bedroom scene where hair is brushed becomes like a scene in a play. It becomes a drama. There are women observed, understood, but not touched. So why do I like La Coiffure? I guess it's because it's such a big, bold, splash of colour. You can't ignore it, and it's such a burst of visual pleasure. I suppose I like the calmness and the rhythm of it, and the texture of the paint, the way you can involve yourself in the surface, discover it. I was at the National Gallery yesterday, and stood in front of the painting for ages just looking at it. There's something about the way that all the shades of red work together that just means you can't take your eyes off it - they kind of shimmer - and the more you look, the more you see. It has depths and layers to it. It's very mysterious. Definately a painting I'd love to have on my walls! I'm an artist living and working in Scotland. Visit my website at www.jibridgland.com for details of shows and exhibitions where you can see my work. It's Official - It's the Olympics!